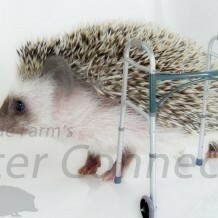 Hedgehogs go through an aging process similar to humans and other animals. As hedgehogs age they become less active and are generally slower in what they do. Their gait may appear to be stiffer and as they age it may be more difficult to get around. Routine veterinary check-ups will help both you and your vet monitor the aging process. Also, it ensures that changes in health are age associated and not due to illness or injury. Older hedgehogs do better at warmer temperatures and will benefit from additional heat sources. Softer diets may be necessary as teeth wear down or fall out.